Ready to do a little shopping on this holiday weekend? If so, here are some of the bargains you are going to find online along with discounts &amp; freebies. •123Inkjets: 15% Off Compatible Ink, 10% Off All Other Ink &amp; Toner with code: LABOR15. Offer ends 9/15/15. •Ace Hardware: $59.99 Shade Tech 10ft x 10ft Instant Canopy &amp; much more. •Best Buy: Labor Day 4-Day Sale. Valid through 9/7. •Brookstone: Save $20 on your order of $99 or more this Labor Day weekend. Just use code LABORDAY at checkout. Offer valid online and in stores, 9/4-9/7! •Catherines: Extra 70% Off Clearance! Online Only. Use Code LABORDAYCA at checkout (valid 9/4-9/7). -$50 off $100 + $100 Off $200! Online only - use code LABORDAYCA at checkout (valid 9/4-9/7). •Charming Charlie: Labor Day Sale! Buy 1 Get 1 Free All Hair Accessories at charming charlie! Ends 9/9/15. Shop now! -Labor Day Sale! Buy 1 Get 1 Free Sale Fashion Jewelry at charming charlie! Ends 9/9/15. Shop now! -$10 Sale Apparel at charming charlie! Ends 9/9/15. Shop Labor Day Sale! -Get $20 Off orders of $75+ at charming charlie! Use code: BAGS20. Shop now! -Get $10 Off orders of $50+ at charming charlie! Use code: BAGS10. Shop now! 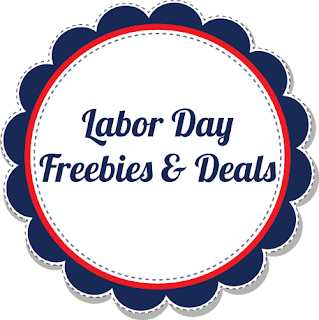 •Craftsy: Big Labor Day classes and supplies sale. Valid 9/4-9/9. •Crazy8: Everything at Crazy 8 is just $12.99 &amp; Under! Offer ends 9/7/15. •Crocs: Buy One, Get One 50% Off Sale with code WORK50. Valid through 9/8/15. •Durango Boots: Get an Extra 20% Off Already Reduced Clearance with code DBLABOR20! Valid through 9/8. •Dyson: Up to 25% off select Dyson Machines. Valid through 9/12/15. •Express: 40% Off Select Express Men's and Women's Items! 40% Off Women's Dresses, Tops and Jeans! 40% Off Men's Dress Shirts, Tees, Shorts and Jeans! Offer ends 9/7/15. •Frederick's of Hollywood: Take An Additional 40% Off Clearance Styles with code: LABORDAY40! Valid 9/3-9/5. •Gap: Up to 40% off everything (and we mean everything) + 20% off your purchase at Gap! Use code EXTRA. Ends 9/5. Restrictions apply. -40% off your purchase at Gap. Use code LABOR. Ends 9/7. Restrictions apply. •Georgia Boot: EXTRA 20% off Clearance! CODE: GBLABOR20. Valid through 9/9/15. •giggle: Surprise savings up to 20% OFF! Offer valid through 9/8/15. •Guess: Enjoy 30-50% Off Select Items offer ends 9/7/15. •Gymboree: Everything at Gymboree is 40% off, with up to 75% off Clearance! Valid through 9/7/15. •Hancock Fabrics: Up to 60% OFF any one fabric at regular price with code AEHTF. •iRobot: 15% off the Braava 380t and the Roomba 800 series. Valid through 9/12/15. •JCPenney: Take $10 off purchases of $25 or more. Use online code PICNIC4U. Save on select original, regular and sale-priced items. Valid 9.2 - 9.7.15. •Jewelry.com: Get 25% Off Sitewide and 33% Off Clearance with code LABORDAY. Valid through 9/7/15. •Julep: HOT DEAL! $98 of Julep Beauty Essentials for Only $24. Valid through 9/7/15. •Kmart: Enjoy extra savings in Apparel, Outdoor Living, Jewelry, Home, and more. Plus, we'll be featuring HOT door busters every day! 8/30-9/7. •Kohl's: $10 off your purchase of $30 or more with code SEPT10. Valid 9/3-9/7. •Lids: Take 25% off $25 for Labor Day! Use code LABOR25, valid 9/4-9/7. Some exclusions apply. •LivingSocial: 20% off sitewide with code LABORDAY20 at LivingSocial. Valid 9/4 12:00am ET through 9/7 11:59pm PT. Max discount $20; Restrictions apply. •Lolly Wolly Doodle: Free Shipping on cute kids clothing this Labor Day with code FSLABORDAY. •My M&amp;M's: 20% Off Everything, use code: MYLDW15. Ends 9/8. •Payless: Buy one, get one HALF OFF at Payless on shoes for you and the whole family - plus get FREE SHIPPING with purchases of $25+! •Perfumania: 20% OFF with Code LABOR20 + Free Shipping, no minimum!. Shop on 9/1 - 9/7 Only! •Puma: 30% Off All Orders 9/3-9/7! Use code LABORDAY15. Offer ends 9/7/15. •QVC: Save 25-50% off the QVC Price on Select Items. Valid 9/4-9/7. •Rocky Boots: EXTRA 20% off Clearance! CODE: RBLABOR20. Valid through 9/9/15. •Rue21: Buy One, Get One for $5! Through September 7th. •Sally Beauty Supply: Save 25% on all online orders $50+ with promo code 555130 at checkout now through 9/7. Excludes OPI, equipment, gift cards and beauty club memberships. •Salt Life: items under $25 while they last. •Sears: 40% off or more Appliance Hot Buys, up to 35% off Kenmore + EXTRA 5-10% off 3+ Kitchen Appliances &amp; FREE Delivery 8/23-9/12. •Shoes.com: Take 25% off your regular-priced order of $100+ with code LDAY25! Restrictions apply. Offer valid 9/3-9/7. •Speedo: Take 25% Off Sitewide at Speedo USA! Use code: LDSALE25. Offer ends 9/7/15. •Sperry: EXTRA 30% off sale styles. Plus, get a FREE Sperry recycled tote bag when you spend $75+ on any regular price items! Valid 9/4-9/8. •Stride rite: Buy One Get One 40% Off with Code: NEWSHOES. Bonus! Earn double rewards. Valid 9/4-9/14. •Teavana: Save 20% - 40% on loose leaf teas and 30% on select Gift Boxes! These offers are valid 9/2 - 9/7 and no code is needed! •The Children's Place: Entire Site 60% Off! Extra 40% Off Clearance! And Site Buster Deals including $9 and Under Denim, 50% Off Graphic Tees, and More! •Vera Bradley: 25% Off Sitewide, Free Envelope Wristlet (MSRP $58) with a $100 Full Price Purchase. Plus, Free Shipping on all US Order! Exclusions Apply. Valid 8/6-8/9. •Firehouse Subs: Free Medium Sub when you purchase an additional sub, chips &amp; medium drink. Must present this offer printed or via mobile device. •Outback Steakhouse: 10% off your entire check through 9/7/15. Today ONLY - Amazon is offering this Coleman 8 Person Canyon Tent for $87.90 (Retail $139.99). This Labor Day weekend, you can get a great deal on magazines! Pick 5 Magazines for $20. There are over 100 titles to choose from. All of these subscriptions ship free, no tax and no auto renewal. Plus, you can send some of your selections as gifts to others. Right now Gel Memory Foam 10 inch Mattress by ExceptionalSheets - Made in the USA, Queen $443.99 (Retail $899.99). -Take advantage of our low introductory price! -Vacuum packed for compact shipping in a box you and a helper can carry right into your bedroom without dodging doorways and tight hallways like you may with a traditional mattress. -Made in the USA and backed by a 10 year limited warranty--Queen Dimensions 60" x 80" x 10"
Hurry over and grab a Personalized Large Tote for $9.99 (Retail $15). Our Large Tote will quickly become your go-to-bag! 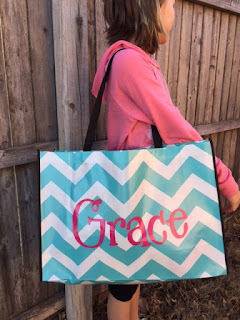 These fun lightweight monogrammed tote bags are great for anything! They measure 20" L x 7" W x 15" H.
Use it for groceries, beach accessories (water resistant) or potlucks (wipes clean). When you're done, simply fold and store it away. The Large Tote is made of laminated polypropylene and features extra wide nylon straps to fit comfortably over the shoulder. Personalized with name or monogram with your choice of premium vinyl in 18 color choices. Shipping: $4.00 for the first item and $2.50 for each additional item. US only. Estimated to ship by Sep 18. 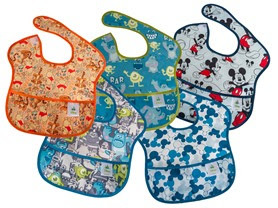 Today only get these Bumkins Disney Waterproof SuperBib in a 5-Pack for only $14.99! Made of Bumkins easy wipe waterproof fabric, and colored with bright designs, the Bumkins SuperBibs are perfect for feeding time with your little one. Today only get 70% off Fall Jackets for the Whole Family! Check out the jackets from top brands like Cole Haan, Tommy Hilfiger, Kenneth Cole, Calvin Klein, and MORE! I just scooped up this super cute Pink Platinum Big Girls' Double Leopard Jacket for my daughter for jut $17.99 (Retail $60)! 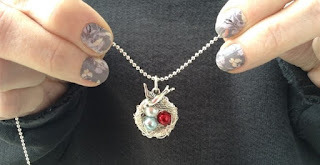 Hurry over and grab this Mama Bird Nest Necklace in Bronze or Silver Wire for $6.99 (Retail $26)! Was $19.99 - Now $7.99 - Kids Leggings! Was $42.99 - Now $19.99 - Perfect Year Round Floral! Head over and check browse around for your favorite boutique clothing, monogrammed gifts, housewares and more!